Calf Carry Glock 23C or Glock 32 in Modified Serpa II with a Trigger Block Safety. Springfield XDm .45 compact carried at 4 o'clock. springfield XD sub 9mm. most reliable and accurate I have! I am not a fan of Taurus, so I say this somewhat begrudgingly, but that is one fine looking weapon. Is that a marketing picture, or did you take it? Great pic in any case. Is this the same (or similar) to what you're referring to? It seems as though there are many who are drinking the XD cool aid. I've shot a few...none of them were for me. I carry a .380 Ruger LCP in a Crossbreed Mini-Tuck when I wear lighter weight clothing. Pretty easy to conceal that with shorts and a light T-shirt and is very comfortable. During cooler months when I wear heavier clothing, I carry my 9mm Glock 26 in a Blackhawk Check-Six holster. 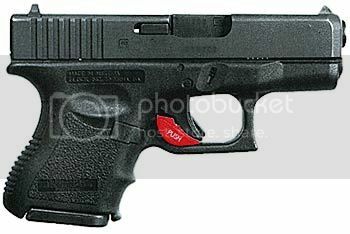 Since concealment is not a requirement in Minnesota, I will also carry my 10mm Glock 20 in a Crossbreed Super Slide on those occasions when I am not concerned about what can be seen. I usually carry a Beretta 92FS, PX4Storm, or 96A1. I carry 2 guns at the same time, a Kimber Ultra Carry II .45acp in a RCS belt holster and a Ruger LCP in a pocket holster. I carry a Wilson Combat extended magazine in the Kimber along with two extra mags in a RCS mag holder on my left side. My wife carries a Springfield XDs .45acp on her hip and an LCP in her pocket. Either a G19 or a PX4 Storm SC IWB between 3 & 4 o'clock.